Wow! No denying that it’s eye-catching. 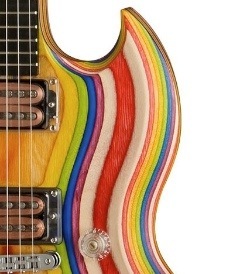 This is the new Gibson SG Zoot Suit. Really, Zoot Suit. It’s made from a sandwich of multiple laminations of birch wood. Each is dyed before being pressed into a single block. Those crazy stripes you’re seeing are the edges of each thin layer of the laminated body – it’s not a paint effect. The images here show the Rainbow finish but it’s available in a number of two-colour finishes that sport alternating laminations of black and red, black and orange, red and blue or black and natural. I think it looks its most striking in rainbow though. The neck too is a multi-coloured sandwich of birch. While I have to assume that the boffins at Gibson have done their homework, something in me balks slightly at the thought of a plywood neck. Certainly laminations of up to five different timbers have been commonly used in neck construction but the Zoot Suit’s neck plies are .075″ thick. In a perfect world, multiple laminations with differently orientated grains would provide for a stable neck. I still feel odd about it though. I’m slightly intrigued by the Zoot Suit. I remember the days of the plywood guitars. Nasty, lightweight things – physically and aurally. 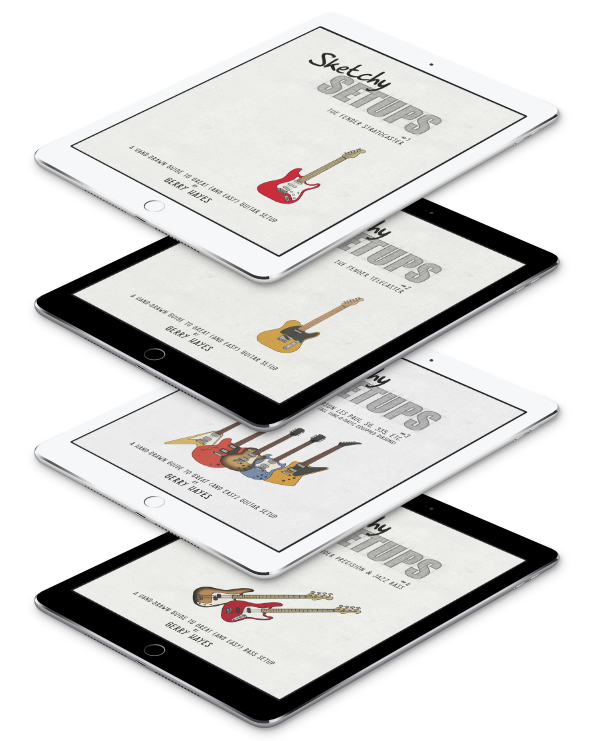 Even now, ‘solid’ is a word used to sell guitars. When was the last time you saw a guitar-maker extolling their all-new, plywood axe? Gibson seems to be aware of this – their marketing bumf mentions that each lamination is bonded together into ‘one solid block’. So can they persuade people to buy a plywood SG? Probably. If it looks like this. I like it, you see. I have a feeling that many won’t but I do. Despite my reservations about laminated guitars, I think this looks great. It’s also loaded with Gibson’s 496R and 500T puppies. These are built to rock and will take the Zoot Suit to a place far from that suggested by its jazzy moniker. The plastic coil bobbins on each are transparent too, letting you see the wire coils underneath. It’s an effect that only works on the right guitar. It works here. Other hardware is pretty standard SG fare but for the fact that the Zoot Suit has a single, master, volume and tone. Tune-o-matic and stop-tailpiece, Grover tuners and a toggle switch handles the, erm, toggling. If you want to be noticed, this should do the trick. Phew, got through this without saying ‘daddy-o’ once. 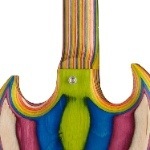 For more information see Gibson’s SG Zoot Suit page.